Deep within their mines, dwarves were known to craft fine and sturdy weapons with the rare materials they found. The Dwarf Double Edge Long LARP Sword pays homage to these mythical people with its beautiful and resilient design. 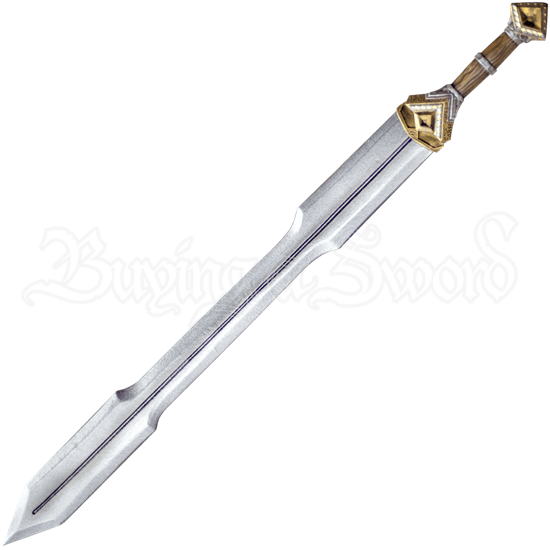 The intricate, ornate features of this high fantasy weapon were masterfully sculpted and painted by hand. A deep fuller runs down the center of the stylized blade. Rectangular cutouts appear at the midsection. Gold and silver accent the narrow cross-guard and pommel. A medium wood grain highlights the grip. The hilt is a polyurethane foam cast, which allows an incredible amount of detail and a slip-resistant hold. This blade is made from an extremely durable foam that does not shred and sealed with a strong coating of latex. Safety is always a concern in LARP, which is why this weapon has a round, flexible fiberglass core with strong Kevlar core tip protection. This LARP sword is approximately 41.3 inches in overall length. This measurement will vary as each LARP sword is handmade.